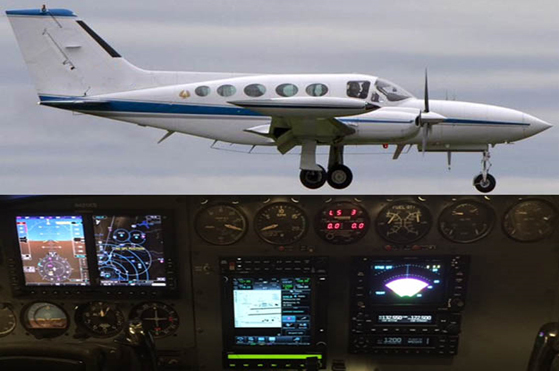 Southeast Aerospace has recently completed a multifaceted Cessna 421B Garmin Avionics package installation. The Garmin Avionics package included the installation of a GTN-750 and GNC-255A for radio communication. The intercom system was wired for a 4 passenger ICS. Music inputs were placed on the aircraft instrument panel and one at the VIP seat for music input via a customer personal device. The GTN-750 was interfaced to the new system 55X and G600 EFIS. The dual transponders were interfaced to the GTN-750 for control. The GTX-345 was panel mounted but able to be controlled via its face plate or the GTN-750. The GTX-335 was remote mounted and controlled via the GTN-750. This installation incorporated the Flight Stream 510 inserted into the GTN-750 to provide wireless interface with a tablet or smart phone for ADS-B In display and database updates for the GTN and the G600 systems. For a complete breakdown and summary of this installation project, please contact the Installation Team at Southeast Aerospace: PMO@seaerospace.com. Copyright © 2016 - 2017 Southeast Aerospace, Inc.